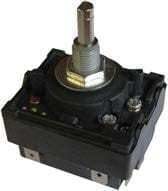 Used as control thermostats or as a safety thermostat with manual reset, these thermostats have a disc made of two different metals laminated together for temperature sensing element. These two metals have different expansion coefficients. Therefore a dome bumped disc will gradually change shapes with increasing temperature until it suddenly snaps from concave to convex. It also comes back with a snap action to its original form when temperature drops. This sudden change activates a contact blade. These thermostats exist with one, two or three pole contacts. Technology to obtain accurate temperatures and low differentials is complex and few manufacturers offer accurate values and low differentials. JPC is one of the very few manufacturers offering three poles models. These control devices, adjustable, slow break, have a very high precision, and low differential: less than 1 °C. They are mounted on a flat wall, fixed by 2 screws. However, due to their slow break, generating 230 parasites, their use in Europe is marginal, limited to laboratory uses or when low differential are sought. Common temperature ranges are from 20 to 250 °C. 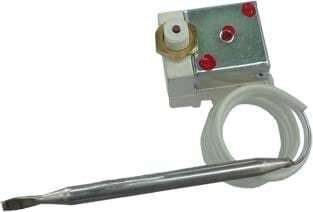 The energy regulators are a type of thermostat bimetal having a heating resistor in contact with this miniature blade. The power of this internal resistance heats the blade, which is deformed and cuts off the supply of the resistance. The blade is then cooled and the contact closes and a new cycle begins, like a flash. The setting pin to change the ratio between the time of opening and closing, and provides the electrical connection to an external load in parallel with the internal resistance. This simple system allows you to adjust continuously the resulting power a heater. The power supply circuit must be specified as the miniature internal heater is made in terms of this tension. 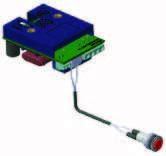 Bulb and capillary thermostats sensing device, usually named “Diastat” is a closed chamber made of a bulb, a capillary and a bellow made of two membranes, filled under vacuum with liquid. When temperature around the bulb increases, the liquid volume expands and inflates the membrane. 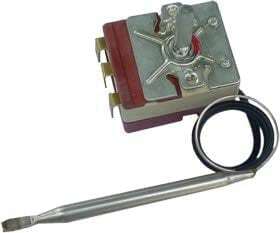 This displacement is used to actuate a snap-action switch mechanism. A threaded shaft, used to modify the bellow position allows temperature adjustments. In standard devices (not fail safe), when a leak occurs in the Diastat, the bellow deflates and electrical contacts remains closed when the temperature rises. The most common ranges go from -35 to +320°C. Higher set points up to 750°C are possible but they require capillary liquids that withstand these temperatures without boiling. JPC is one the very few companies manufacturing these models. These high temperature versions (ranges above 400 °C) use a liquid metal as filling liquid, usually a Sodium Potassium eutectic. In case of breakage or leak of the Diastat, this liquid is flammable on contact with water or atmospheric moisture. It is therefore necessary to take this point into account in their applications. The capillary thermostats are subject to drift due to temperature variations on the capillary and the bellows. The bulb and capillary thermostat differential is usually not adjustable, and is about 2.5% of the temperature range. They are available in single pole or three pole versions. These thermostats are the oldest systems of temperature control, and the first of them was invented by French engineer Jean Simon Bonnemain in 1783. They use the differential expansion of two metals to activate a mechanism. They are widely used in storage water heaters and in boilers. Their calibration is not subject to ambient temperature variation drift such as liquid expansion bulb and capillary thermostats. They are available with control action or manual reset action. 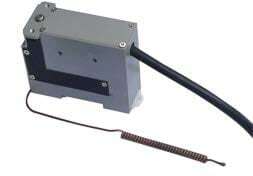 Their specificity is that the measuring rod is secured to the adjustment head and electrical contacts. Current models, using a brass or stainless steel tube and invar rod, have measuring ranges between -50 and +400 ° C. JPC is currently the oldest French manufacturer of this type of thermostats. Built on the same mechanical basis than the standard thermostats, and achievable within the same temperature ranges, these thermostats use an explosion-proof micro switch which is a unique design concept developed by JPC. The advantage of this system is to avoid heavy and expensive IIB or IIC metal boxes, and to allow temperature set point adjustment without need to switch off the electrical power supply. The thermostat can be fitted in Y8 series standard waterproof enclosures, but its output cable connection must necessarily take place in an ‘’increased safety’’ enclosure or outside the hazardous areas. The most recent versions include a built in increased safety enclosure. 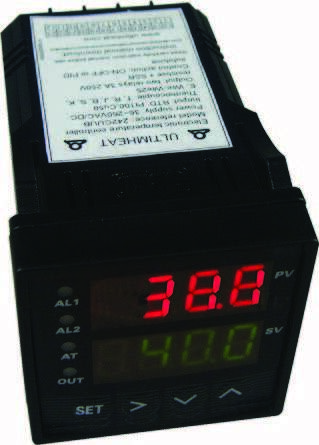 Depending of models, electrical rating can go from 5A 250V SPDT to 15A400V SPDT. 2 poles versions are also available. These devices operate on a principle similar to the liquid expansion bulb and capillary thermostats and are not adjustable. They include a reset button to close the electrical contact when it has opened after a temperature rise. There is one variant of these cut out, with a fail-safe mechanism. It automatically opens the contacts if the capillary or bulb are leaking or cut. The Diastat membrane is artificially inflated. Leakage causes the bursting of the membrane below its nominal thickness at room temperature, and a special mechanism will detects the abnormal displace- ment, witch is similar to a very low ambient temperature sensing. The disadvantage of this system is that these fail-safe limiters also switch off when the ambient temperature drops below a certain value, generally between -10 and -20 °C. The artificial inflation of the membrane also greatly increased the volume of liquid it contains, thus makes them highly sensitive to temperature, with temperature drifts up to 0.3 ° K / ° K. They can be used as an high limit safety device in addition to a mechanical thermostat or an electronic controller. They are available in single pole, two, three or four poles versions. They usually only have open on rise contacts. These devices operate on the same principle as the control thermostats, but feature a reset button to close the electrical contact when it opened after a temperature rise. They can be used as an overheating safety system behind a mechanical thermostat or an electronic controller. JPC is one of the few manufacturers offering this kind of thermostats with the same adjustment ranges than the control thermostats, and a change-over contact (which enables to signal a defect without relaying), and with ranges up to 750 °C. These devices operate on a different principle than liquid expansion thermostat. They use a simple mechanism, invented 50 years ago by the Wilcolator company, combining the snap action of a bumped disc actuated by the huge pressure increase due to the boiling of liquid in a closed chamber. This design concept provides very simple mechanisms. Technology lies in the selection of liquids with different boiling points. Operating temperatures ranges are linked to the liquid used and its boiling temperature. Capillary length is also limited due to pressure losses induced during boiling, hindering its operation. It is necessary that a relatively large volume of liquid is boiled to cause the membrane tripping. This is the reason why the capillary end measuring temperature is spiraled. If the capillaries are not spiraled, at least 30cm of it must be immersed in the controlled liquid. They are never adjustable and have a reset button to switch one the electrical contact when it is open as a result of an increase in temperature. As the filling is carried out under vacuum, a leak in the train thermostat triggers the mechanism. Unlike liquid filled systems sensitive to changes in temperature, they do not trigger when the temperature drops below a limit. However, they are slightly sensitive to changes in atmospheric pressure, which limits their use in altitude. 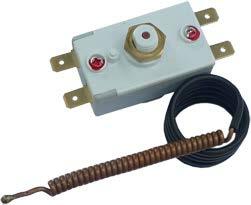 They can be used as a safety system of a mechanical thermostat behind overheating or an electronic controller. They are available with single pole, 2, 3 and 4 poles contacts. They usually have open on temperature rise contacts. Some models developed by JPC have SPDT and DPDT contacts. Current models, using a brass or stainless steel tube and invar rod, have measuring ranges between-50 and +400 °C. JPC is currently the oldest French manufacturer of this type of thermostats. Built on the same mechanical base than failsafe boiling cut out, and achievable within the same temperature ranges, these thermostats use an explosion proof switch. The advantage of this system is to avoid heavy and expensive IIB or IIC explosion proof housings. The thermostat output cable connection must necessarily take place in an ‘’increased safety’’ enclosure or outside the hazardous areas. The most recent versions include a built in increased safety “e” enclosure. Depending of models, electrical rating can go from 5A 250V SPDT to 15A 400V SPDT. 2 poles versions are also available. These devices operate on the same principle as the control thermostats, but feature a double bulb, one used for the control, the other for the manual reset. They have an adjustment shaft for the control, and a manual reset button allows switch on again the safety electrical contact, when it opened after a temperature rise. The safety set point is factory fixed. The contacts are open on temperature rise only. They are mainly used in three-phase applications, although there are SPNO and DPNO versions. There are versions of these devices with failsafe manual reset contact, but they have a strong drift when the ambient temperature of the head varies, up to 0.3 °C / °C. For example if there is a variation in ambient temperature of 10 °C on the thermostat head, the set point drift can be as 3 °C. These devices work by expansion of liquid for the temperature control, and use the boiling fail safe mechanism for the manual reset cut out. In this way they meet the more stringent security requirements, as both mechanisms are operating on different principles, and the ambient temperature drift on the manual reset cut out is eliminated. 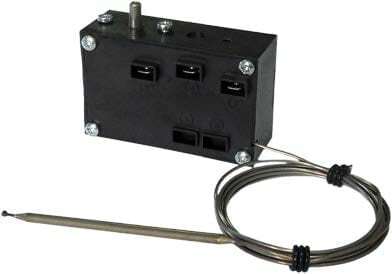 JPC uses this solution for its combined thermostats for explosion proof applications. The thermal fuse cut-outs are composed of a contact mechanism triggered by melting of a metal or plastic pellet. They open irreversibly an electrical contact at a given temperature. Their trigger point should be selected according to the normal operating temperature and sufficiently distant from it to avoid false triggering. Their installation is hard to perform. 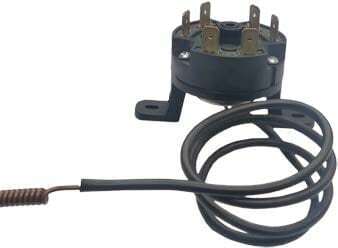 JPC has developed a range of 16A 250V cut-offs which are wired and silicone insulated. They allow easy mounting in pockets. 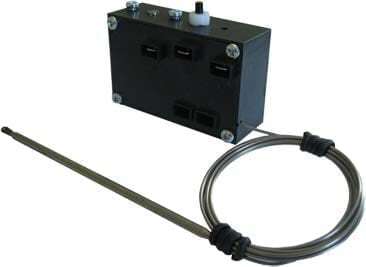 The temperature sensors provide a signal which is a function proportional to the temperature. This signal may be a change in resistance (thermistors, Pt100) or a millivolt signal (thermocouple). The selection of a sensor depends on the required accuracy, the temperature range and dimensional and economic constraints. JPC has designed a simple and cheap range for intrators. These products, developed by JPCI, provide a bridge between the electronic controls with digital display and the electromechanical thermostats of which they keep the setting ranges, mounting, current rating, on/off action, and with whom they are generally interchangeable. They are inexpensive, allow measurements at larger distances than the bulb and capillary thermostats. They provide a greater accuracy and the ability to adjust the contact differential. These products, developed by JPCI offer a simple solution when a safety system must be installed in addition to an electronic temperature control. 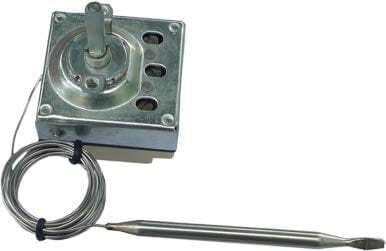 These devices keep the setting ranges, fixing, electrical rating of the electromechanical thermostats with which they are generally interchangeable. They are inexpensive, and allow measurements at distances larger than the bulb and capillary thermostats. Power supply 90-250V, 16A 250V output relay. These controllers, developped by JPCI offer the same performance than blind electronic thermostats, but have a digital display of temperature, and are extremely simple to use. Power supply 90-250V, and 16A 250V output relay. Simple and intuitive to set and use, within the reach of non-professional users. 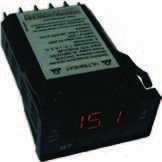 230V supply, relay output 10 or 16A, ON-OFF action. The smallest new generation of electronic temperature controls, multi-voltage, multi-sensors, PID and ON-OFF action and auto-tune. 3A relay and SSR control outputs. One alarm. The most efficient new generation electronic temperature controls, multi-voltage, multi-sensors, ON-OFF and PID action with auto-tune. 3A relay and SSR control outputs. One or two alarms.